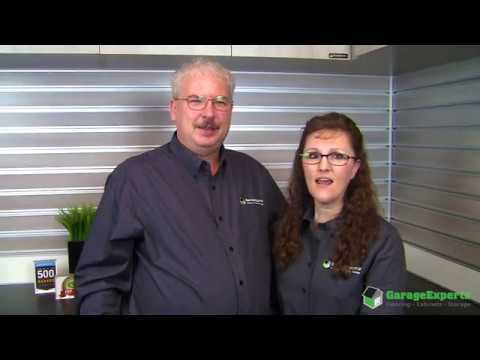 Hi, we are Todd and Pam Gunter, owners of Garage Experts of the Wasatch Front. Being married for almost 30 years has brought many amazing opportunities into our lives. Raising our family of three and adding our eight grandchildren to the mix has been a tremendous blessing. Spending over 17 years along the Wasatch Front, and more recently 10 years in Southeast Idaho, we’ve enjoyed thriving careers working for ourselves in two successful businesses as well as working for Fortune 500 corporations. So what brought us to Garage Experts? As owners of more than 2000 square feet of storage space between our shop and garage, we’ve learned space means nothing unless there is some level of organization. No matter how much space you have, without organization, it is never enough. No matter how hard we work to keep them clean and organized, projects are left out on workbenches, tools are difficult to find, and sports equipment is left scattered because there’s no space to really store them. And where is the car parked? Outside because there’s no place to park in the garage! Garage Experts specializes in products which literally turns garages and basements from “dumping grounds” to gorgeous spaces in as little as two days. With industrial strength cabinetry, durable slatwall systems, and state-of-the-art Garage FX flooring with a Lifetime Warranty, garages and basements are being transformed into beautiful, functional rooms extending the livable space in homes. With over 147 floor color options and 15 beautiful cabinet colors to choose from, the possibilities are endless. In our quest to find a reputable company which stands behind their products, offers solutions to real-life problems, and was nationally recognized, Garage Experts was our answer. After researching their products we immediately became passionate and wanted to be a part of their team and more importantly, it was our desire to offer these same products to our friends, family and neighbors along the Wasatch Front. What better way to start our journey? Alpine, Alta, Bluffdale, Brighton, Canyon Rim, Copperton, Draper, Eagle Mountain, Grantsville, Herriman, Holladay, Kearns, Lakepoint, Lehi, Magna, Midvale, Millcreek, Murray, Riverton, Salt Lake City, Sandy, Saratoga Springs, South Jordan, Stansbury Park, Taylorsville, Tooele, West Jordan, West Valley City, and More! GarageExperts of The Wasatch Front is your local garage makeover expert. View some of our recent work.